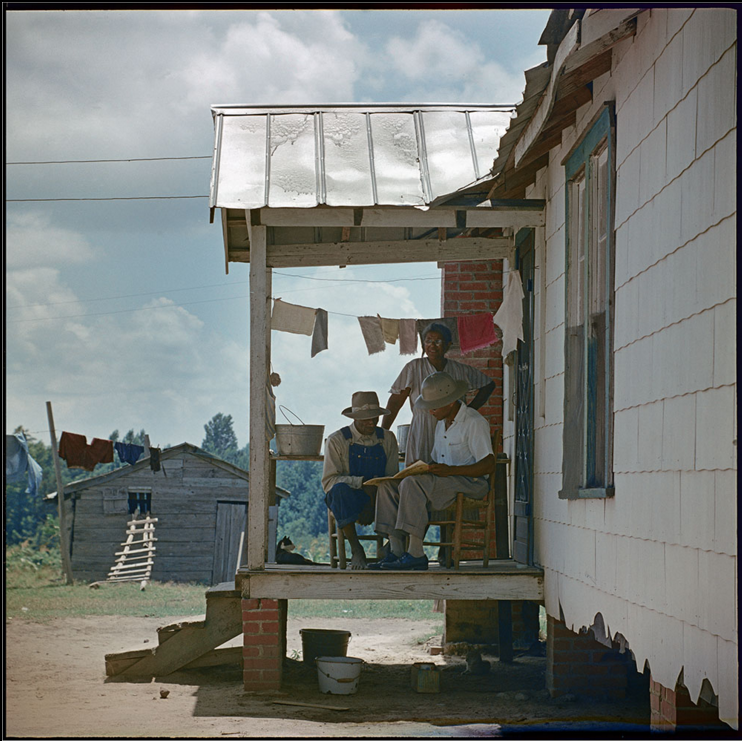 When Life magazine sent Gordon Parks to document the daily lives of three black families living in Alabama, it was 1956, during the Montgomery bus boycott. He knew he could have gotten beaten or killed — but he went there anyway. He was in Alabama shortly after Rosa Parks became world famous for not giving up her seat to a white man and around the same time the Klu Klux Klan had mobilized to defend segregation. In other words, Parks’s assignment was to become a fly on the wall during one of the most turbulent times in American history. While there, he witnessed, among other things, the emergence of a young leader named Martin Luther King Jr., then known as the president of the Montgomery Improvement Association. But Parks was not there to photograph King; he was always in the foreground. 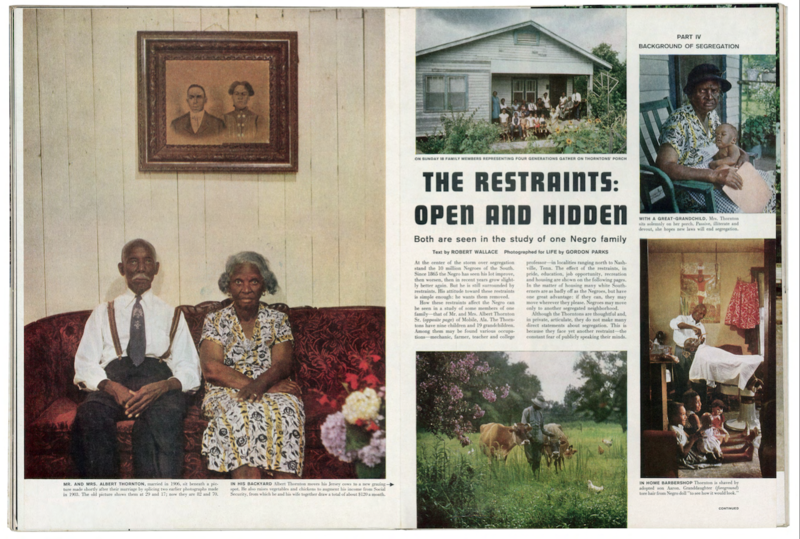 On the contrary, Life wanted Parks to reveal what had always been in the background — ordinary black families — and show the magazine’s readers how they really lived. The project was to be a counterpoint to misinformation spread by segregationists who claimed that a racially separated, caste-based society was good for everyone. So Parks followed various people around, going to the store, to the mall, to playgrounds, and to school; he hung out at their ramshackle homes, most of which looked like they were straight out of the 19th century, which they probably were, and took pictures everywhere he went. In the end, Life published just 26 of those photographs — all shot on color slide film — and then the rest were put away in a small box and forgotten. Since that time, nobody has seen them — not until they were rediscovered in 2012 by archivists at the Gordon Parks Foundation. The gorgeous, large prints now on view at Salon 94 are a selection of those images, and like a candle in a dark room they illuminate that long-forgotten history. Significantly, most images of the Civil Rights era are in black and white, shot mostly by photojournalists. Parks, however, was no ordinary photographer — he was an artist who happened to also be a photographer and as these pictures show, he frequently deviated from his journalistic impulses to capture what can only be considered great art. The central photograph in the show is unmistakably brilliant and, I’d say, somewhat of a modern masterpiece. 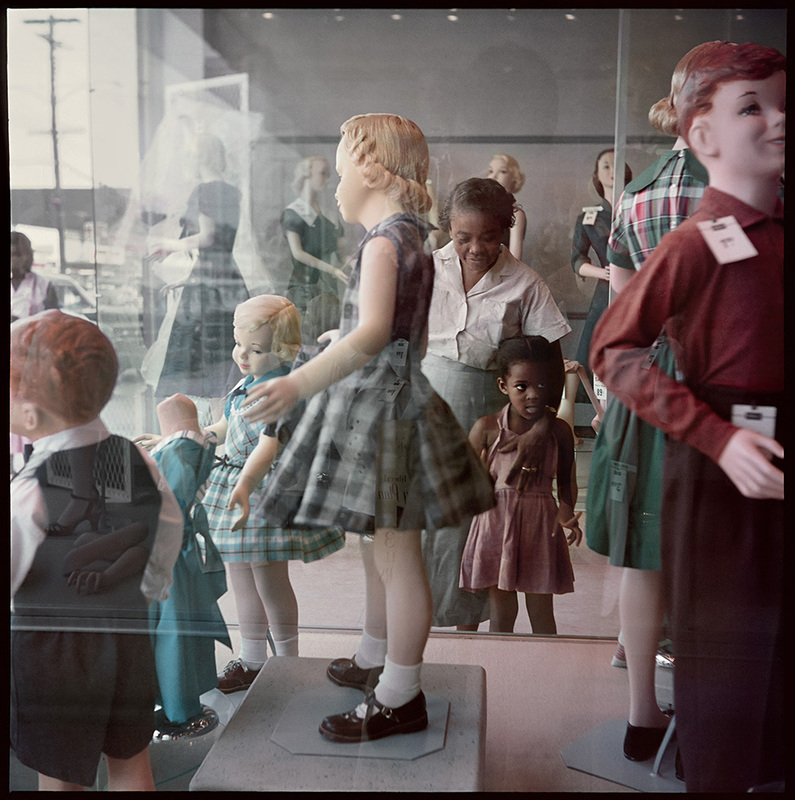 “Ondria Tanner and Her Grandmother Window-shopping, Mobile, Alabama, 1956” surpasses the documentary tradition Parks excelled at, transforming everything in his viewfinder into charged symbolic space. To get this image Parks placed himself on the other side of a big glass display case that was full of white-skinned mannequins and framed a woman and her grandchild in such a way that it seems as if the little girl were being guided through a forest of white, soulless zombies. You get the sense the woman and girl must tread lightly and be careful — lest they awaken these dangerous figures. The sweetness of the gesture and the vibrant image shot in radiant color evoke both warmth and danger at the same time. More striking yet is the almost invisible reflection of the photographer in the window. It is not a didactic image; it is composed more like a Botticelli painting or a mannerist allegory. In 1956, the American public was in deep denial about pretty much everything, but most especially about the state of race relations. 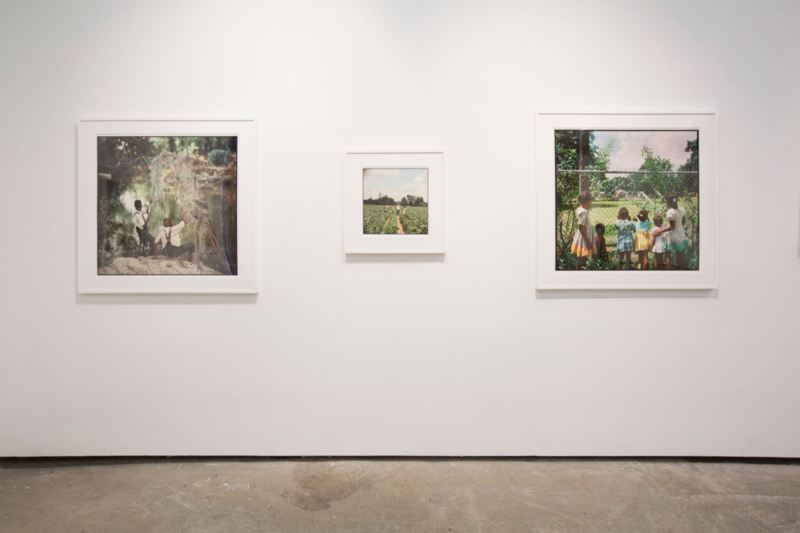 So Parks’s challenge was not merely to depict Jim Crow and its corrosive effects, but to depict it in such a way that even people in denial could empathize with those he photographed. While it’s easy to depict segregation by showing signs saying “Whites Only” or “Colored Only,” Parks often preferred a more nuanced approach. A good example is “Willie Causey Jr., with Gun During Violence in Alabama, Shady Grove” — an alarmingly casual scene which was taken from a doorway. In profile, a shirtless Willie Causey Jr., who is a teenager, sits holding a rifle in his lap, looking bored. In the background are two boys on a bed and a woman is reading to them. Causey Jr. is not shown as a victim or an aggressor, but more as a reluctant guardian of his family. The image silently resonates with the murder of 14-year-old Emmett Till the year before. Till had been dragged out of his house in the middle of the night with his family unable to protect him. These little boys, though, had Willie Causey Jr. there watching out for them. In this way, it is a profoundly sweet and simultaneously bold picture. Another personal favorite is a view of an elderly couple on the porch of their ragged-looking home. From his vantage point, Parks shows us three people: the barefoot husband, the observing wife, and their safari-hat wearing mailman, who, we discover, is reading them their mail because the elderly couple is illiterate. With his camera set up in front of the house, but off to one side, every little sad, chipped tile of the worn-out siding is visible; the unpainted shed in the background is leaning to one side. Every detail in the picture is subtext, including the old couple’s shotgun shack, which, in the process of falling apart, conveys a tragedy of Greek proportions perpetrated on the black residents of Alabama. At first glance, there is almost nothing special about this picture, which has the feel of a snapshot. And yet, even in the darkest shadows there is clarity — in the print at Salon 94, you can clearly see a small cat under the porch, lurking in the shadows. Likewise, in the brightest spots nothing is washed out and in pictures like these, a good camera makes all the difference. As a Life photographer, Parks had an array of cameras available to him and so he brought his sophisticated eye along with some really great camera lenses to portray in color what, up until then, was mostly seen in gritty black and white. Basically, he was using the same tools that make starlets look gorgeous in order to bring realism to the segregated misery of the mid-century South. And it’s true; his subjects understood that at least one person was going to make sure their story got told, even if they themselves were trapped in a narrative that was almost impossible to escape. 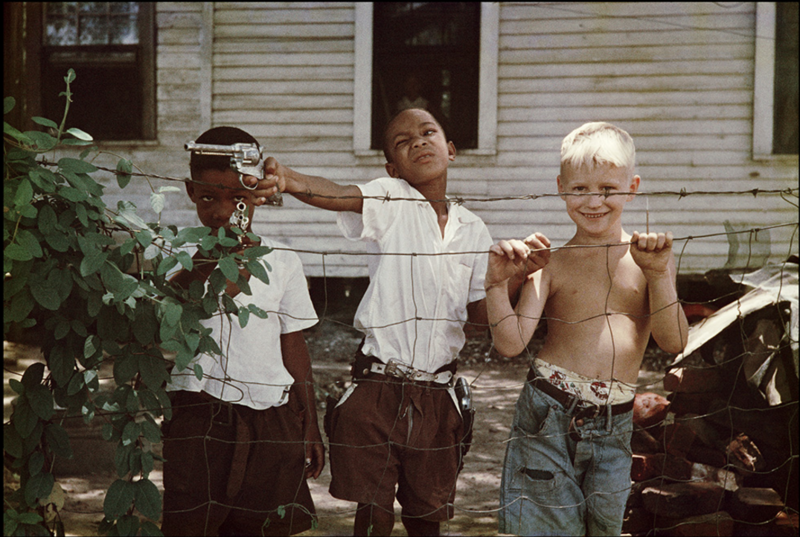 Segregation Story: Gordon Parks continues at Salon 94 Bowery (243 Bowery, Lower East Side, Manhattan) through January 17. Photos from the same series are currently also on view in Gordon Parks: A Segregation Story 1956 at Rhona Hoffman Gallery (118 North Peoria Street, Chicago) through February 20.